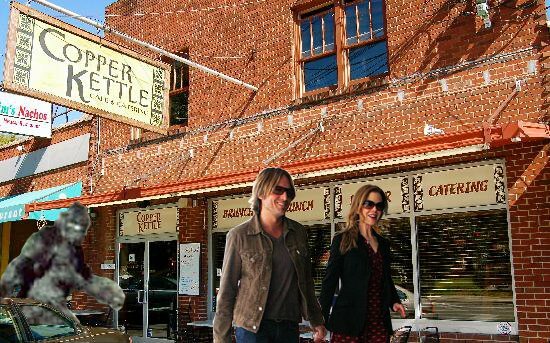 Local star-gazers, who make a habit of “spotting” resident celebrities Nicole Kidman and Keith Urban, received an extra surprise this past weekend when the couple was spotted having Sunday brunch at the Copper Kettle with the mythological creature known as Bigfoot. Kidman reportedly befriended Bigfoot at last year’s Sundance Film Festival as they promoted their films “Rabbit Hole” and “Letters From the Big Man”, respectively. Afterwards, it was reported that Bigfoot was in talks to take on a supporting role in Kidman’s upcoming film “Stoker”, but negotiations fell-through at the last minute according to The Hollywood Reporter. Similarly, for months, rumors have circulated that Bigfoot and Kidman’s country-singer husband would collaborate on an album to be titled “Urban Legends: Mountain Music from Both Coasts”, though Capitol Records Nashville dismissed this as “wishful thinking”. This weekend’s encounter on Granny White Pike marks the first concrete Kidman/Urban/Bigfoot sighting since the Utah press junkets a year ago. “I was struck by how polite he was” reported Copper Kettle Shift Manager Jessie Kingston. “I mean, Keith & Nicole are always nice and polite; they’re two of our favorite regulars here. But you just don’t expect someone who is as tall and furry and feral-looking as Bigfoot to be so nice too, and he really was. He was just a treat, a real pleasure to have here.” Many diners remarked that it was unusual to see a 7-foot tall human-ape-hybrid dining with the 5’8” Urban and 5’11” Kidman at first, but most also noted that his gracious charm and complete willingness to sign autographs quickly won over nearly everyone present. Meanwhile in the Pacific Northwest, Jim Franklin, 2012 President of the Bigfoot Watchers Advocacy Society, expressed his dismay upon hearing of the very public sighting two time-zones away. “These Tennessee folks get to have autographs and breakfast with it? I’ve been camping in these hills most of my life, and the closest I’ve ever come is a really fuzzy Polaroid I shot from 50 yards away, and one time I saw Pauly Shore wandering around naked and stoned. I tell you, it just isn’t fair.” Pauly Shore could not be reached for comment. « Nashville shocked to learn that downtown’s “Batman Building” is really Bruce Wayne.